In this article we are going to learn Java Exceptions, Errors , How to handle those exceptions, different types of exceptions with some easy and understandable examples. Every application or program has its normal flow , but sometimes the normal flow of the program is disrupted. An exception is nothing but a reason behind the disruption of the program or application. So for exceptions or exceptional events occurrence the program is going to be terminated abnormally. Now you might think that this is ridiculous for the programmer as when the exception occurs we usually get an error message which is system generated. But nothing to worry as these exceptions can be handled. We will learn those process step by step later in this article. We can divide an program into two parts. Part one is the compilation part and 2nd part is running or execution of the program. When an exception occurs during compilation of the program it is knows as compile time exception and when an exception occurs during the execution of the program it is known as runtime exception . and there is a lot of other reasons too. Some of these exceptions are occurred by user , some exceptions are made by the programmer and it is noticeable that in many cases we found exceptions for hardware problem. so based on this reasons the exceptions are divided into two categories. suppose you are trying to read a file by using FileReader, but the file does not exist in the specified path. In this situation FileNotFoundException will occur. Runtime exceptions are known as unchecked exception as the compiler does not check if the programmer handled the exception or not. If you don’t use API properly you may face runtime exception. Though its our responsibility to handle the exceptions as much as we can in the program. lets take an example. you have declared an array of size 3 and you are trying to reach at the 4th element, you can say its not possible as the size of the element is 3. so if we run this program it will show us an message. This exception is known as ArrayIndexOutOfBoundsException. if we try to divide a number by zero it will show us an error message. these type of exceptions are known as ArithmeticException. Errors are basically those serious problems which should not be handled by the application. example : memory errors, JVM errors. generally you can do nothing in your code to control errors. 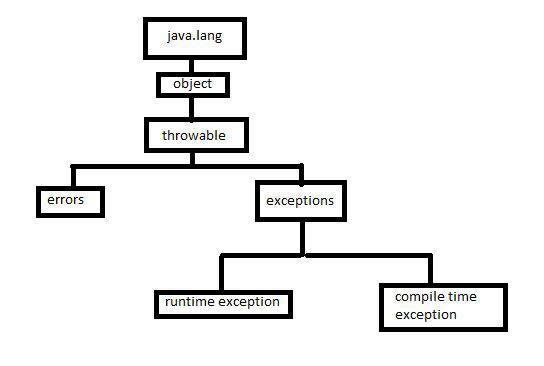 Since I have discussed about exceptions now you all know that exceptions are not good to be in a program. So we have to handle those exceptions carefully. there are some keywords (special keywords) to handle those exceptions that might be occurred in a program. java exception handling is nothing but a mechanism to resolve the exceptions that might be occurred.